Please find templates attached to the bottom of this article. You may use them as a starting point for a confidential word document, email or spreadsheet. Alternatively if you are on a Windows computer, you may save the Confidential Label as a Quick-Part, instructions below (this feature is not yet available on the Mac OS). You will also find instructions for best practice when it comes to keeping confidential emails safe. 1. Open the attached document "Confidential Word Template." Highlight (Select all of) the contents of the document. Under the "Insert" Tab, select the "Quick Parts" drop-down menu and select "Auto-Text" > "Save Selection to Auto Text Gallery." 2. In the pop-up window, type "Confidential Label" into the "Name" field. For "Save in:" Select "Normal" and click OK. Now your label is saved as a Quick Part. 3. 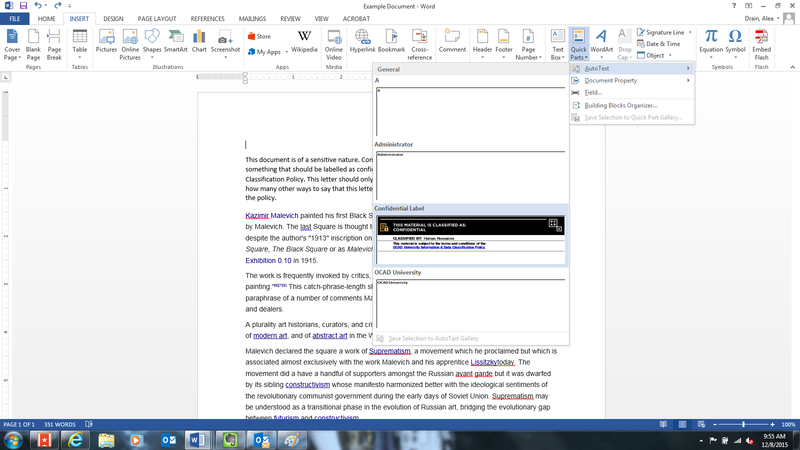 To label a document as confidential, ensure the cursor is at the top of the body of the document. 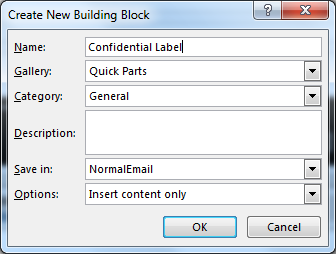 Select Insert > Quick Part > Auto Text and select your saved "Confidential Label." 1. 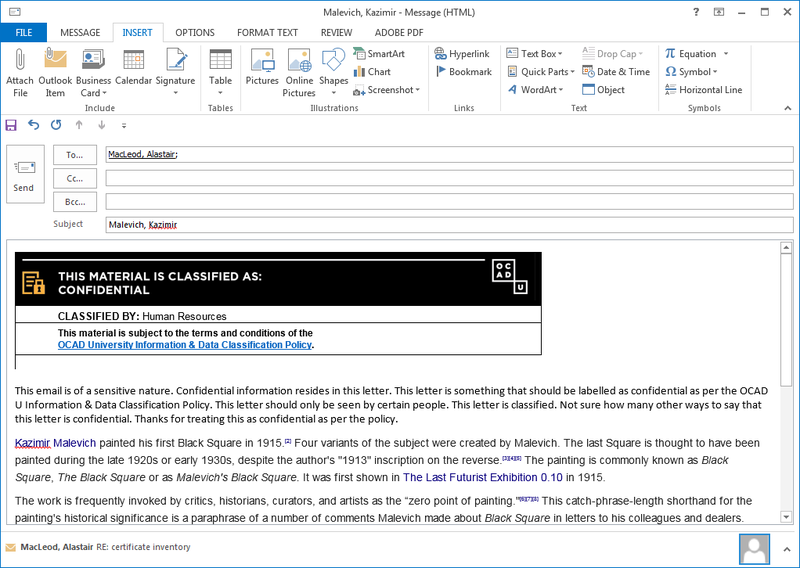 Open the attached document "Confidential Word Template" and copy and paste the label into a new email. Highlight (Select all of) the contents of the email. Under the "Insert" Tab, select the "Quick Parts" drop-down menu and select "Auto-Text" > "Save Selection to Auto Text Gallery." 2. In the pop-up window, type "Confidential Label" into the "Name" field and click OK. Now your label is saved as a Quick Part. 3. 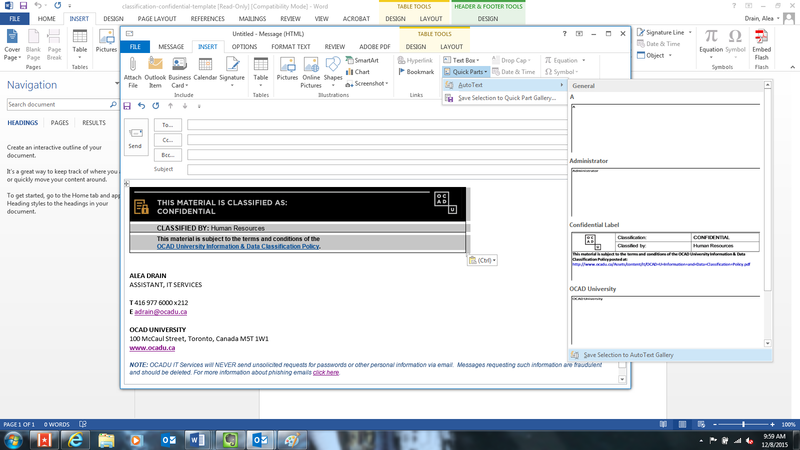 To label an email as confidential, ensure the cursor is at the top of the body of the email. 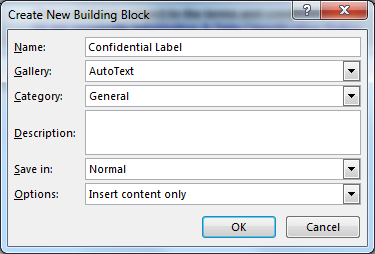 Select Insert > Quick Part > Auto Text and select your saved "Confidential Label." Excel does not have auto-text quick part functionality. 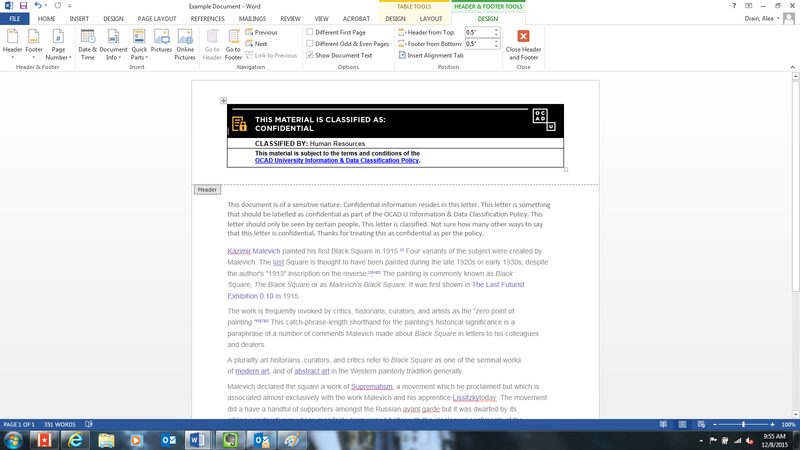 An editable template is attached to this article, "Confidential Excel Template." You may either use the spreadsheet as a starting point for a confidential spreadsheet, or simply copy and paste the contents of the template into a workbook you have already built. In order to avoid any undesirable formatting changes, the label could be pasted into the workbook as the first sheet, as opposed to directly into the sheet that contains the data. 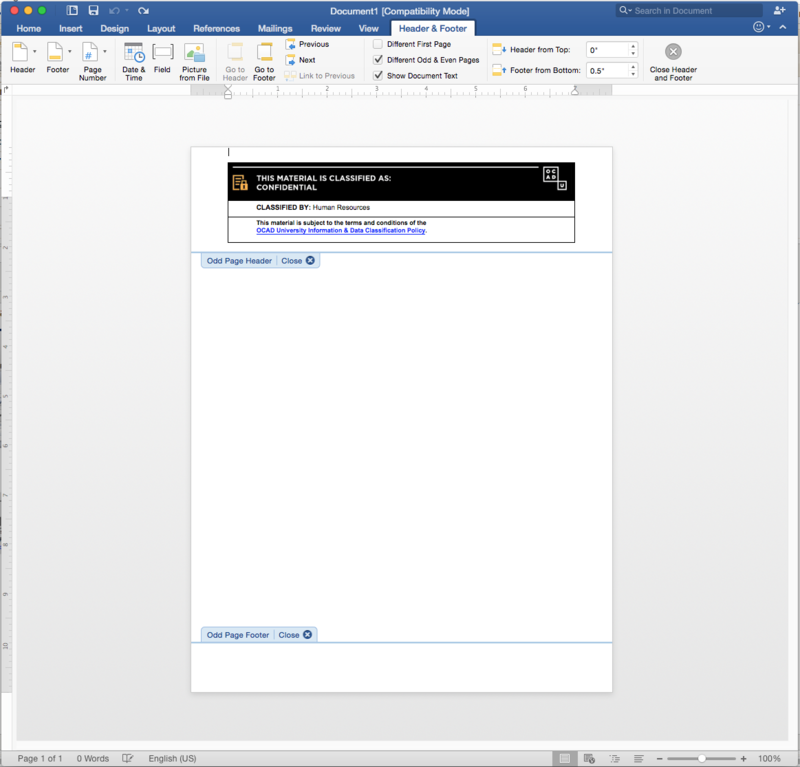 Option 1: Open the attached template titled "Confidential Word Template" and edit it to the label that you will be using. Save it on your desktop and copy and paste the contents into your document or email as required. 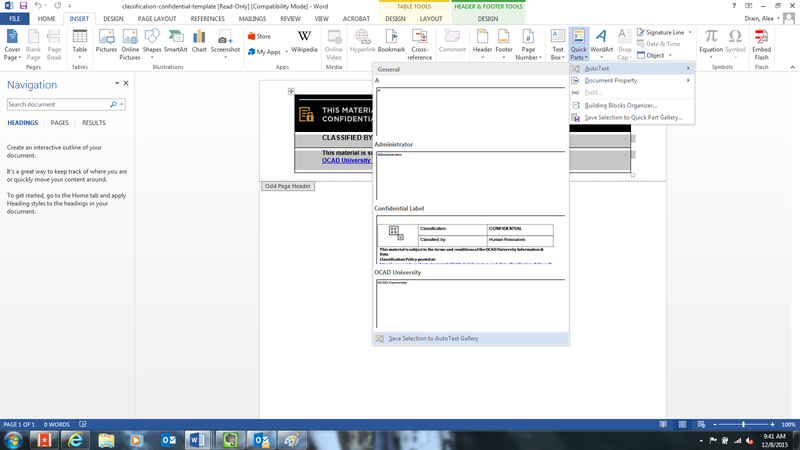 Option 2: Open the attached template "Confidential Word Template" and edit it to the label that you will be using. Take a screen shot of the label and it will automatically save to your desktop as a png. Click and drag the .png file into your documents or emails as required. Hold down Command(⌘)+Shift+4 and your cursor will turn into a crosshairs symbol. Click and hold while selecting the area that you wish to capture. When you release, a .png file will automatically be saved to your desktop. Rename the .png to "Confidential Label" and keep on your desktop for easy click and drag into documents and emails. Save all confidential emails in it's own Outlook folder (a sub folder of your inbox) and save all emails from this folder to your H:drive on a regular basis. Once you save the emails to your H:drive, delete them from your Outlook folder. Emails that are saved into a folder other than your inbox are not backed up to a server and are therefore stored only on your local hard drive. It is beneficial for you to save your confidential emails to a subfolder in your inbox or the H:drive to ensure you do not lose any important documentation as a result of hard drive failure. Storing important and confidential emails to your inbox, especially for a long amount of time, put them more at a security risk. This is especially the case if your email is accessible by your mobile phone, which may be wiped remotely, however that only can occur once the user notices that the phone is missing. 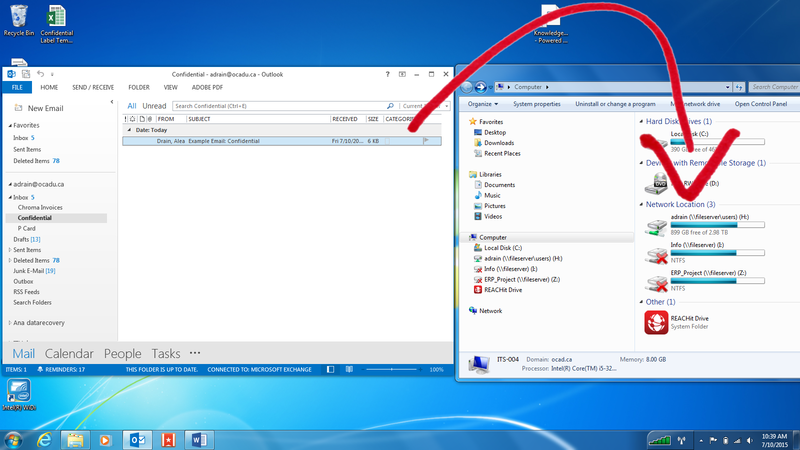 How do I move my confidential emails to my H:Drive? Simply click and drag selected emails from your Confidential folder to your desired H:drive folder. You may select all at once for efficiency. 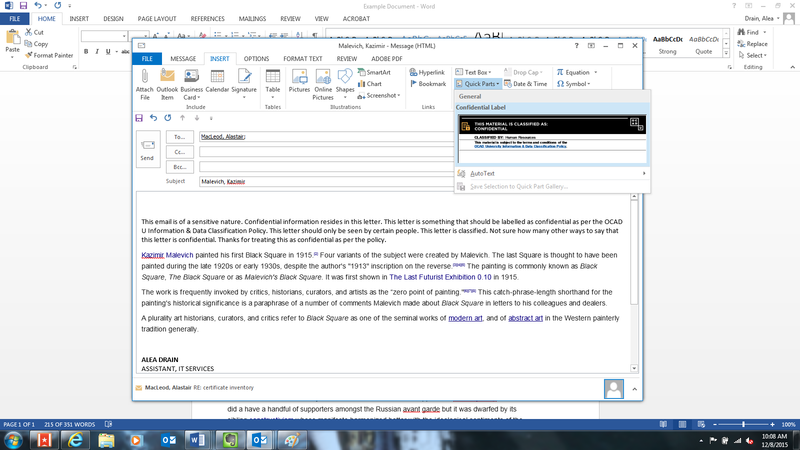 Note: You cannot drag a folder from Outlook, but only the emails contained within.